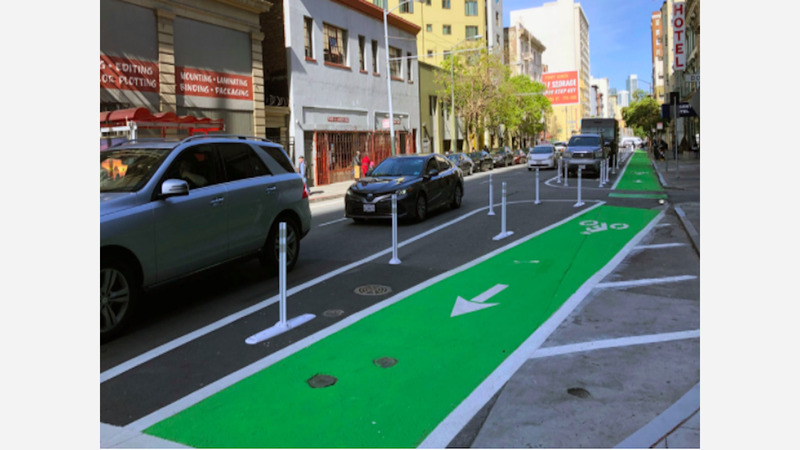 The Tenderloin's first protected bike lane officially opens tomorrow with a ribbon-cutting ceremony on Turk Street. Work on the bike lane was completed earlier this month, and District 6 Supervisor Jane Kim will celebrate its debut during rush hour on Thursday. The bike lane, which stretches between Mason and Polk streets, is one of several safety improvements recently made to Turk Street. Other changes include high-visibility pedestrian crosswalks, no-parking buffers, and painted safety zones. The street has also been reduced by one lane to calm traffic and provide more buffer space between different modes of travel. Turk Street between Market and Gough is known as a high-injury corridor, with many collisions involving pedestrians and bicyclists in recent years. The improvements made through the Turk Street Safety Project aim to bring the city closer to meeting its Vision Zero goal of eliminating all traffic-related deaths by 2024. The new protected bike lane is a result of strong community lobbying, including demonstrations where participants linked arms to form a human chain on nearby Golden Gate Avenue, where an unprotected lane for cyclists is frequently blocked by parked or turning vehicles. 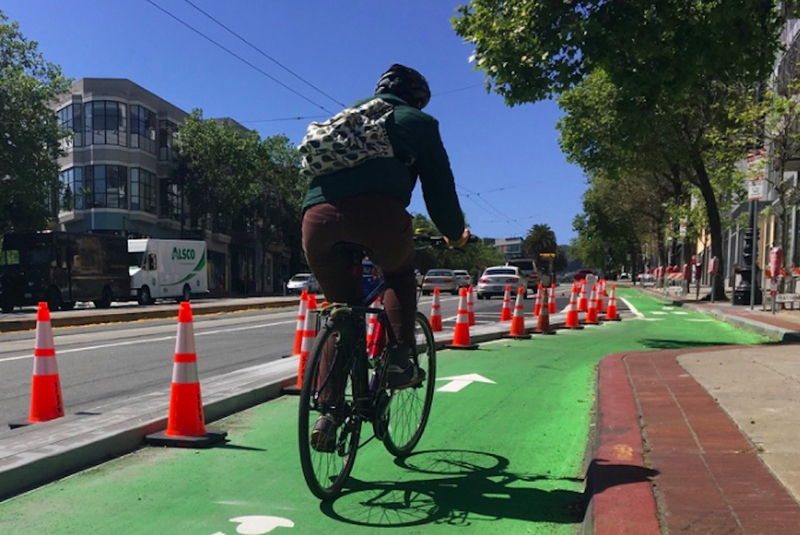 TheSan Francisco Bicycle Coalition has only opposed one bike lane during its history of bike advocacy in the city, said spokesperson Chris Cassidy. 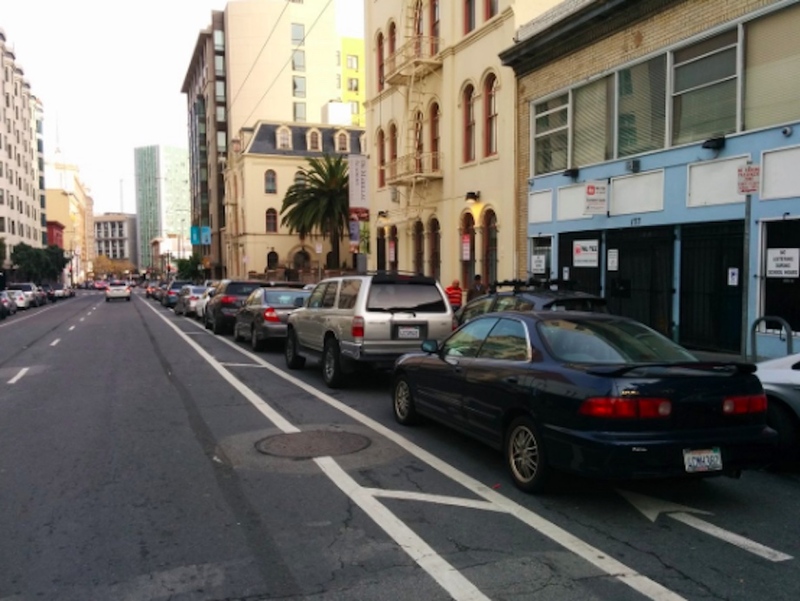 That opposition was to the initial, unprotected designs of the Turk Street bike lane, he said. Initial plans for Turk Street would have replicated the Golden Gate Avenue design, which would have been "repeating a mistake," Cassidy said. "Supervisor Jane Kim deserves credit for joining us at an otherwise obscure SFMTA engineering hearing to send city planners back to the drawing board," Cassidy said. Cassidy said there are more streets where unprotected bike lanes would still be an improvement, such as in the Outer Sunset, where there's less congestion and density. Downtown, protected bike lanes are needed on streets like Turk Street due to "today's congestion and... a rash of people dropping off and picking up passengers" in what should be a an open lane of traffic, he said. 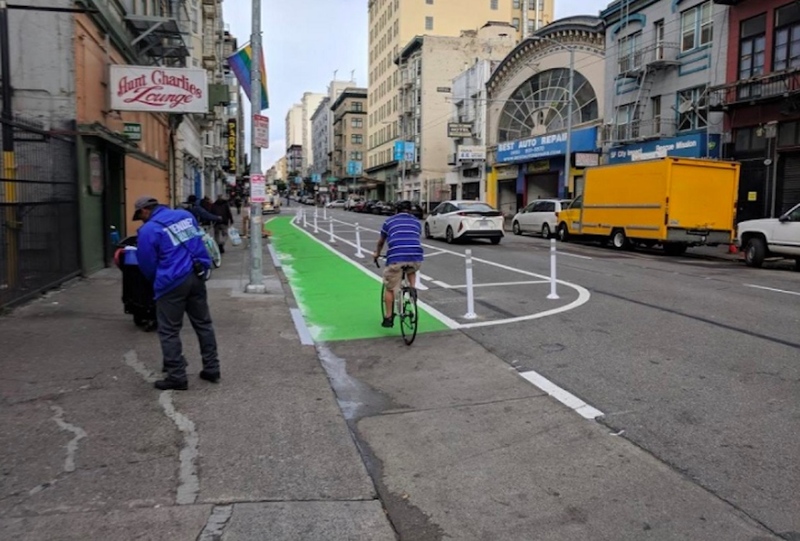 Construction is also wrapping up on the Upper Market Street bike lanes between Octavia Boulevard and Duboce Avenue, with installation expected to be complete before Bike to Work Day on May 10, according to SFMTA.